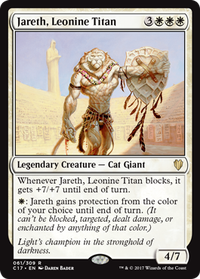 Additionally, I just remembered there was such a deck that cared about big creatures and their power - Cragganwick Cremator. An emrakul discarded to it is 15 damage, an Impervious Greatwurm is 16 damage. You can finish them off with a Lightning Bolt to the face. 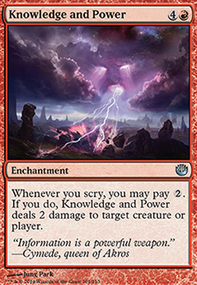 Additionally, there are several other cards that care about the mana cost of something to deal damage - Erratic Explosion, Riddle of Lightning, Explosive Revelation that care for the CMC of the cards. Especially when you can stack something on top of your library like Thunderous Wrath. 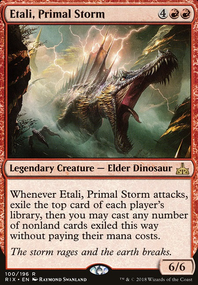 Seems like a cool way to care about big creatures. Chasmolinker - There is a reason, and it is that fireblast hits for 6 off Erratic Explosion and Riddle of Lightning, compared to the Volley, which hits for one off of them. For that reason, I do not run Lightning Bolt, but Staggershock instead. 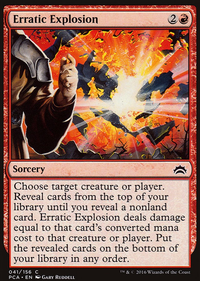 See also Erratic Explosion, Riddle of Lightning, Explosive Revelation, and Blast of Genius. Erratic victory is a deck I built a long time ago. I do plan to rebuild it, this time with Thunderous Wrath included in the place of Ridge Rannet. 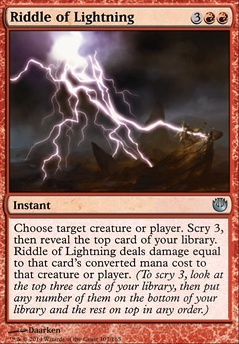 With something like Erratic victory orRiddle of Lightning you can easily arrange it so that they take 6 from the CMC of Wrath and 5 off of the miracle.